Currently EXCLUSIVE TO PBS! Celebrate the life and teachings of Dr. Wayne W. Dyer, “the father of motivation,” with this retrospective of his appearances on public television—a cause close to his heart. Featuring memorable stories both funny and soulful, Wayne’s musings on his favorite quotes, and the insights of the poets and philosophers who inspired his own life, this three-hour video is both a look back at an iconic thinker as well as a wonderful introduction for those not yet familiar with his groundbreaking work. Includes bonus material not seen in the broadcast. 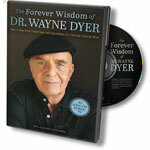 - DVD of program: The Forever Wisdom of Dr. Wayne Dyer. Currenty EXCLUSIVE TO PBS! Celebrate the life and teachings of Dr. Wayne W. Dyer, “the father of motivation,” with this retrospective of his appearances on public television—a cause close to his heart. This three-hour video is both a look back at an iconic thinker as well as a wonderful introduction for those not yet familiar with his groundbreaking work. Includes bonus material not seen in the broadcast. 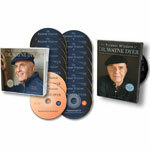 This stunning collection presents the final eight public-television programs created by iconic thinker Dr. Wayne Dyer, as well as two of his enlightening meditation CDs. Running Time: Approximately 10 hours. 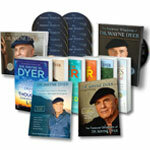 - Audio Downloads - Download audio versions of eight of Dr. Dyer's pledge specials, plus two workshops, and his last recorded lecture, "I Am Light"
Seven weeks of in-depth lessons on forgiveness, divine love, and living your life with purpose; plus four powerful meditations. Work at your own pace.